The Skellig's tale stems from the Great Darmonican War, it was a skyship in service with the Tylander Air Service. During the conflict she fought in a number of skirmishes against her Commonwealth and Artian counterparts, though as a raider rather than at the forefront of battle. Her involvement in the raid on the Artian liftorium refinery at Stomberg was a particular highlight of her career. At some point during the War she was ordered to Alyeska, this was unusual as Tylander skyships normally conducted raider style missions round the Commonwealth's Home Isles rather than some far-flung colony. It is believed that she was sent to pick up some sort of cargo found by Tylander agents and bring it back to Tyland, though both the cargo and the mission itself has never been confirmed or denied. But is a moot point as the Skellig was lost with all hands after picking up the cargo, about the time this supposedly took place a Commonwealth air patrol reported seeing an unidentified skyship over the Alyeskan Outlands but lost her in the clouds. 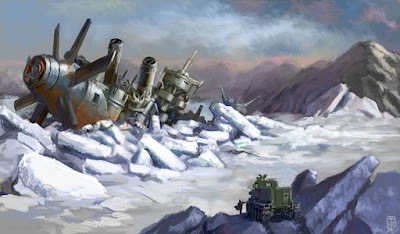 To this day the Skellig's ultimate fate remains unknown, though a handful of people have reported finding a crashed skyship in the ice north of Prospector's Reach. Though whenever somebody went out to double check the reported location there was nothing to be found, though there is some speculation that the wreck moves with the ice flows as its been reported in different locations. Likewise there is some belief that the Skellig's cargo may had been some sort of Ancient Terran device that could've led to her lost.